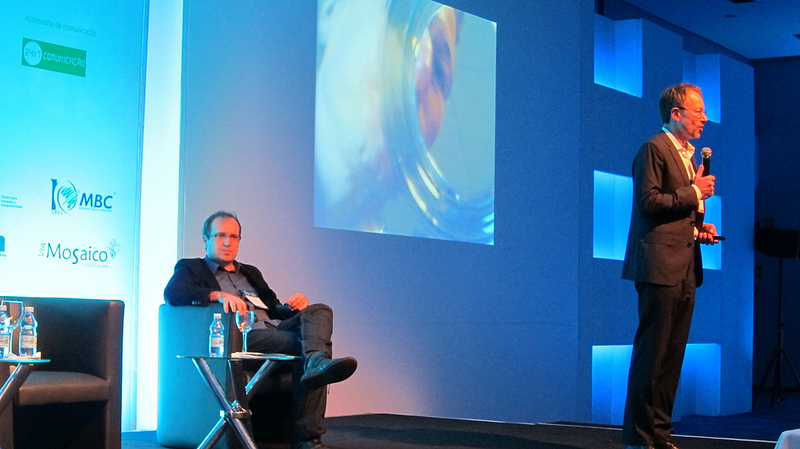 Having written a couple of general articles on the Strategy Execution Summit 2013, I thought I would explore some of the themes more deeply, and in this one I take a look at the concept of customer experience as explored by Harry West, CEO of global innovation and design agency Continuum. On one level there is nothing hard to grasp about the concept of the customer experience. It is how customers experience not only the products and services they purchase, but also their entire experience from the very first contact with a company or organisation, through to their ending their relationship. However, there are three reasons which organisations struggle to understand the customer experience. One is that some products or services are complex. One project I worked on was BT’s Onephone with Ericsson. This project aimed to merge cordless phone technology (DECT) with mobile phone technology (GSM) thus meaning that customers would only ever need one handset, and not two. But the customer experience was phenomenally difficult to map out and design for, especially as both the handset owner and the person calling them would need to understand how much they would be getting charged for the calls. With these kinds of projects not only is prototyping required, but tools such as user scenarios are needed to map out “day in the life of” of a customer, thus developing insights as to problematic areas or opportunities for better design. The second aspect is a little more difficult to pin down, but for me it is mainly due to the fact that often those most senior in an organisation are not genuine customers or users of their own products and services, and therefore many aspects of the customer experience are lost on them, especially those experiences which can infuriate customers the most. The third reason we can categorise as philosophical, and this is the idea that it can be almost impossible to really know the experience of others. This is a huge area of exploration, but that branch of philosophy known as phenomenology has dedicated to the study and understanding of lived experience, and although many of the great philosophers of phenomenology from the last century could not find agreement, for me it is not only being aware of the questions they ask, but also contemplating their questions and indeed trying to understanding their questions that is of greatest value. Harry began his talk by discussing the business design process. 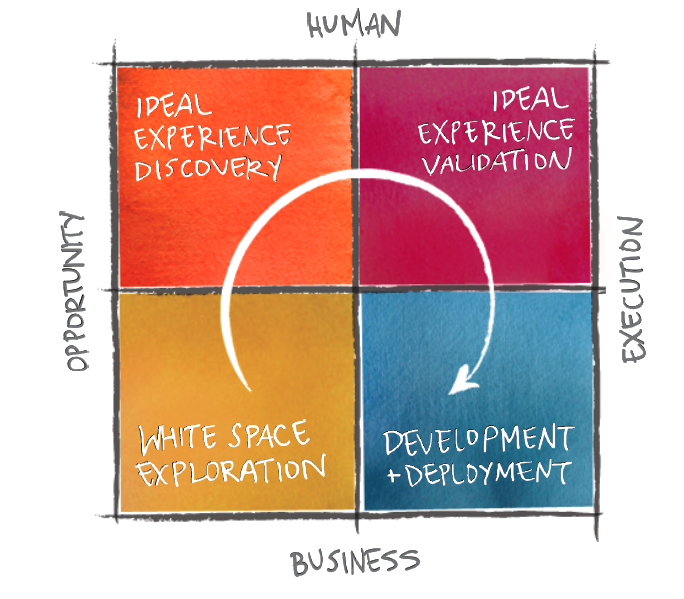 The problem in many companies was that when they design, they jump straight from white space exploration to development and deployment without first exploring or validating the customer experience. What I want to do is now focus on the in-depth case study he presented on Tetra-Pak, which really shows what this means in practice. 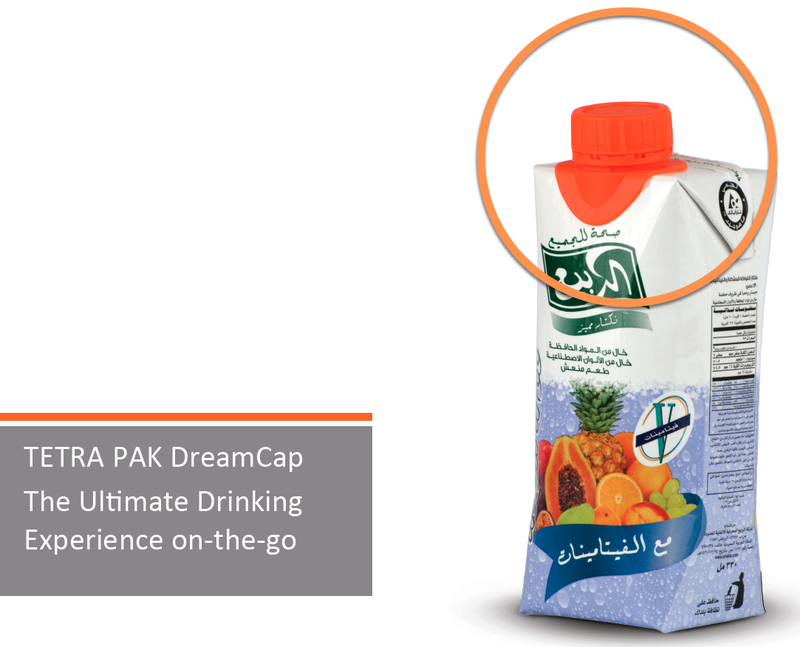 Tetra Pak had been losing market share as more and more people were consuming drinks on-the-go. Their designs were not suitable for this, and so they came up with a new design. 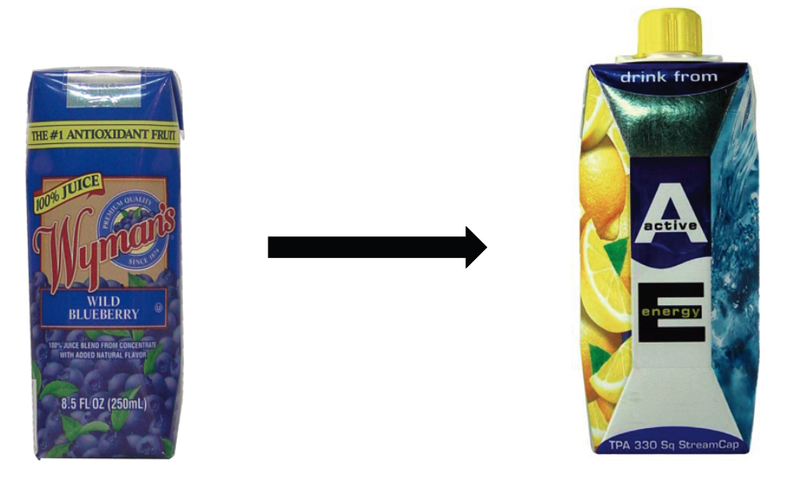 In a classic example of “framing a problem”, Tetra Pak had framed their problem by limiting the hole to the top of the pack. The final design was created, but as soon as it launched it was a failure, with many customers rejecting it. Why was that? After failing to answer this problem, Tetra Pak consulted Continuum. In a previous article of mine on product design, Google Glass and phenomenology I wrote that “to see well is an act of humility” and the approach of Continuum is a very good example of this. Continuum approached the problem by acknowledging that they were not experts in drinking, and asked Tetra Pak if they had studied how people drink. The answer surprisingly was no, and in his presentation Harry noted how there is likely to be a PhD available for the first person to study how we drink. There are many different ways to study human actions, and at BT Laboratories we had every type of equipment possible to observe, record and measure. It is interesting the types of insight you can find. For example, when we were designing BT Callminder, the trials recorded people speaking instructions. But we found that if people say “yes” or “no” to a prompt, rather than pressing “1” or “2” they attribute far more intelligence to the system, and sometimes start to use natural language, talking to it as if it were human, and thanking it too. Continuum did the same, and even created a special glass with a camera at the bottom so that they could observe the position of the mouth (see the photo at the top of the article). Through these studies, it was discovered that there were three ways of drinking, and people always had a preference for one type. Not only that, but the reason why some people rejected the first Tetra Pak design was that the nose was getting in the way, thus forcing some people to change their style of drinking. This case study for me is an excellent example of both understanding the importance of the customer experience, and having the ability to develop creative insights without being blinkered by the straight-jacket of your mental models. Based on their many different experiments, Continuum then decided to create a prototype (see below). As can be seen, this design is based on a solution which incorporates the side as well as top of the box, and is suitable for all three ways of drinking. 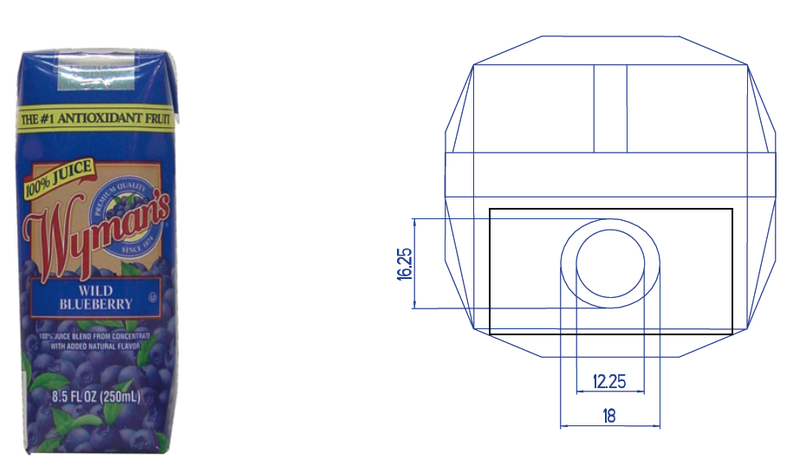 However, it would take Tetra Pak some years to actually develop this design into a workable solution due to the complexities involved, and it was finally launched last year. It is interesting to see how complex the customer experiences of some seemingly simple services can be. One of the first projects I worked on was Call Waiting, which is where your phone beeps to tell you that some is trying to call you if you are already speaking to someone. At the time, this service was pretty terrible to use, especially when switching the service on and off. I forget the code, but you had to dial something like *#51# or some such code. However, we ran focus groups to examine the dynamics of call waiting in families which were great fun. So imagine there is a teenage daughter chatting to a friend, and a parent is waiting for an important call. Is Call Waiting ignored or acted on by the daughter? There were many scenarios like this, although now that children all have smart phones, the dynamics of telephony in families has changed dramatically. I can thoroughly recommend that you read Emma’s article in full. I recently received also a new scientific paper on the dynamic way of seeing, but unfortunately it is only accessible to those who have a subscription to the journal Studies in History and Philosophy of Biological and Biomedical Sciences (http://dx.doi.org/10.1016/j.shpsc.2013.05.019). The title of Mark F. Riegner’s paper is Ancestor of the new archetypal biology: Goethe’s dynamic typology as a model for contemporary evolutionary developmental biology which potentially disguises the excellent description of just what the dynamic way of seeing is, and just how relevant it is to those outside of both biology and the sciences, in terms of helping us to evolve our own ways of seeing and thinking. Henri would have pointed out, though, that “the whole” was present *intensively* in every part, but nowhere present *extensively* as ‘the whole system’. That might sound like a quibble, but it’s not meant as such. Because of our conditioning in ‘systems thinking’, it can be extremely hard to understand what Henri was talking about without collapsing it back into the familiar paradigm (I certainly found it so). But I think this point is fundamental to Henri’s approach: “the whole” can never manifest itself in its entirety – what shows itself is only one face of the whole, which is constantly in movement – and what we see as “the whole system” is a *counterfeit whole” (like saying *this deer* is the same as *deer* – or better – *this deer* is the same as *to deer*). Typology is a systematic classification or study of types, and its place in developmental biology has been controversial due to the conceptualisation being static. But in Goethe we find a way of seeing that understands typology from a dynamic point of view, a point of view which is easily missed or not comprehended. Riegner provides an example of the dynamic way of understanding typology by showing us the Common Sowthistle (Sonchus oleraceus) and Common Ragweed (Ambrosia artemisiifolia) in the diagram below. These pictures were created by taking of of each plant, and taking the leaves from the plant from the bottom of the stem, and working upwards. 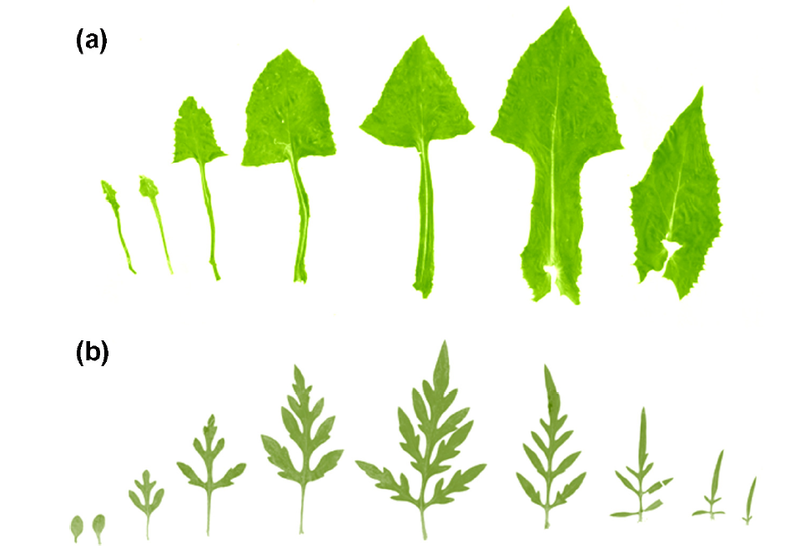 What you are therefore seeing are leaves from a single plant in a static moment in time, from the bottom of the stems to the top. Can a 10 kg lump of clay help us see better than Google’s new glasses? Interesting article. But why don’t you reference Emma’s article, and give her surname? You give us everyone else’s surnames (and they all happen to be men). Emma is a friend and she has written a number of articles for Transition Consciousness. Her article is a blog article which if you look is referenced within the text by an active link. (The references are a journal article and two books). I am a big supporter of Emma’s work and on the Papers section you will also see a link to her dissertation.